Incompatible software warning at install Your first alert to potential problems can happen right out of the gate—before you even complete your upgrade to Lion. 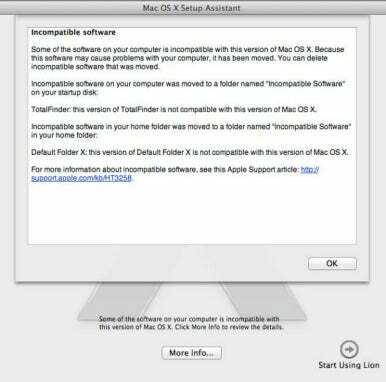 During the Mac OS X Setup Assistant phase of installing Lion, you may get a warning of “incompatible software.” Identified items are moved to an Incompatible Software folder on your drive. This early warning system will not ferret out all software that hiccups under Lion. Rather, as Apple indicates, it focuses on apps that “can quit unexpectedly or cause other issues.” It especially seems to focus on software that runs in the background—such as the versions of Default Folder X and TotalFinder cited in the figure above. You should respect the Installer’s wisdom. Don’t bother trying to re-enable or run the disabled software. If you do, you will likely get another similar warning. A better solution is to check with the vendor for possible updates. Indeed, a Lion-compatible Default Folder X 4.4.3 and TotalFinder 1.2.1 are now available. PowerPC warning As you’ve probably heard by now, Mac OS X Lion does not support Rosetta. This means that you won’t be able to launch older Mac applications designed to run on Macs with PowerPC (as opposed to Intel) processors. If you attempt to launch one of these Rosetta-dependent programs from the Finder, you’ll be greeted with a warning, as seen in the figure below. The PowerPC app that’s been getting the most publicity in this regard has been Quicken. However, many other familiar applications are suffering the same fate. For example, if you still use the Rosetta-dependent Microsoft Office for Mac 2004, it will not work in Lion (Office 2008 and 2011 are Intel apps and should work fine). The same issue affects Unsanity’s WindowShade X (as well as its other Application Enhancer utilities). In this case, Application Enhancer recognizes the upgrade to Lion and automatically disables WindowShade X.
I just read today that numerous Freeverse games require Rosetta. It’s the end of the line for these games. Freeverse has no plans to update them. Vendor web sites If an application survives these first two gauntlets, it’s still not home free. If, after upgrading to Lion, you notice anything unusual with third-party software, visit the vendor’s web site to find out if they have posted Lion-related information. For example, a Rogue Amoeba blog posting notes: “The Instant On component used by Airfoil, Audio Hijack Pro, and Nicecast has not yet been updated for Lion compatibility.” The developers are working on updates, expected soon. “Many Adobe applications are dependent on the Oracle Java Runtime Environment (JRE) for some features to work.” The problem is that Java is no longer automatically installed as part of Lion. Without Java, these applications may crash on launch or hang on quit. The good news is that the solution is easy: Lion prompts you to install Java when you launch any application that requires it. An Adobe article offers more details on how to do this. Acrobat customers who utilize forms, digital signatures, portfolios, and related features may see problems when rendering PDF documents in Safari 5.1 and Lion. Adobe’s recommendation for these users is to stick with Safari 5.0 for now. As will be true for many applications, Adobe’s programs have not yet been updated to take advantage of Lion’s new “Resume” feature. This means Adobe applications will not automatically “Restore windows when quitting and re-opening apps.” There is nothing you can do about this except to hope for an eventual upgrade that adds this support. Finally, if you use Adobe Drive 2 or 2.1, Adobe recommends that you “not upgrade to OS 10.7 at this time” due to a problem displaying folder contents. RoaringApps If you still need help regarding a third-party application, perhaps you would like a listing of almost every program that runs on a Mac together with a brief indication as to whether or not the program is Lion-compatible. If that’s what you want, your wish has been granted. Just hoof it over to the RoaringApps Application Compatibility Wiki for Mac OS X Lion.